Not quite what I was looking for. But amusing. They look like snails, right? You know those cute little bunny buns that are all over Pinterest? 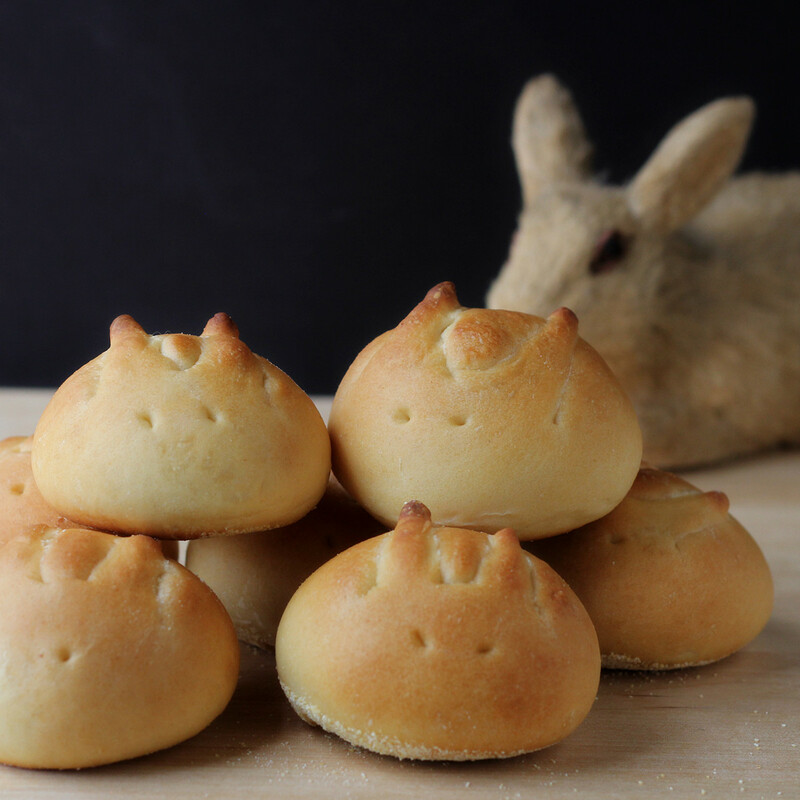 And then everyone makes them and they look like little rabid demon buns? Yeah, I decided to make them. The original recipe is for steamed buns, which is why people who are baking traditional buns tend to have problems with the recipe. The ears are usually the issue. I mean, there's not much more to them than an oval ball with bunny ears. But of course, bread is elastic and it doesn't always behave the way you want it to. It expands, of course. but smaller parts, like the cut ears, can move or shrink during baking. And then the bunnies look all wrong. The first few times I made the buns, I had the same sorts of problems. Then I thought, gee, I'll bet this would work better if I let the buns rise overnight in the refrigerator. 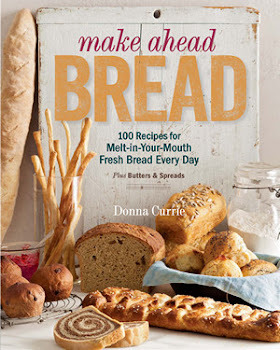 That's part of the premise of my book, Make Ahead Bread - you make the dough and shape it one day, and bake it another day. Besides being more convenient, bread that has a long, slow rise has more flavor. But the other thing is that it changes the way the dough rises, and it also affects the oven spring. Hello, bunnies! The final version was a success! I thought it might be the answer to the bunny-ear issue. And I was correct. I was much happier with the results when the dough had its chilly rest. It's still not a slam-dunk that every bunny will be 100 percent great - it's still bread, so it's still a little unpredictable. But this method certainly gave me bunnies instead of demon critters. It takes a little practice to figure out how long to make the ears and how deep to cut them. So if these buns are on your agenda, you might want to practice just a little bit before you make them for a special occasion. Combine all of the ingredients in the bowl of your stand mixer and knead with the dough hook until the dough is smooth and elastic. Cover the bowl and set aside until the dough is doubled in size, about an hour. Dust your work surface with flour and sprinkle a baking sheet with cornmeal or line with parchment paper. Turn out the dough, divide it into 12 pieces, and form each piece into an oval or egg-shape. Arrange the finished pieces on the baking sheet. If you have another baking sheet the same size, you can use that as a lid for the pan. Secure it with rubber bands to keep it in place. Otherwise, cover the pan with plastic wrap. Refrigerate the dough overnight, or up to 24 hours. Remove the pan from the refrigerator and preheat the oven to 325 degrees - I like to let the buns sit at room temperature for 30 minutes while the oven heats. 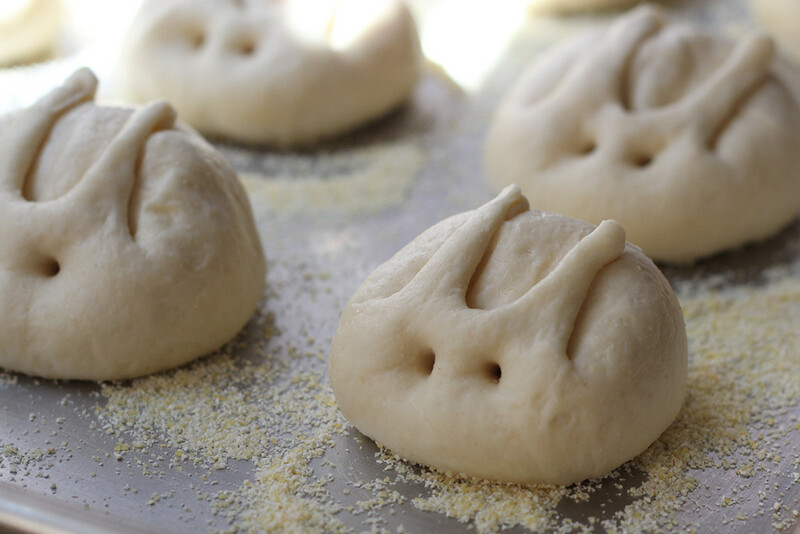 Right before you're ready to bake, use a small sharp pair of scissors to cut two long bunny ears on each bun. Fold the tips over so the ears are more rounded on the top rather than pointy. The ears are likely to shrink during baking, so pull them to make them longer. Seriously longer. Make them longer than you think you need. Use a skewer to poke holes in the dough for the eyes. Don't be shy - poke deep. The holes will tend to close up, so a bigger, deeper hole is better than a shy little poke. Bake the buns at 325 degrees until nicely browned, about 30 minutes. Remove the buns from the oven and let them cool on a rack. If you want to give them a little more character, you can use food-safe pens (you can buy them at craft stores and some supermarkets) to enhance the eyes or draw in a mouth. I didn't bother - I thought they were fine as-is.